The unusual detail in Princess Eugenie's wedding 'thank you' cards. 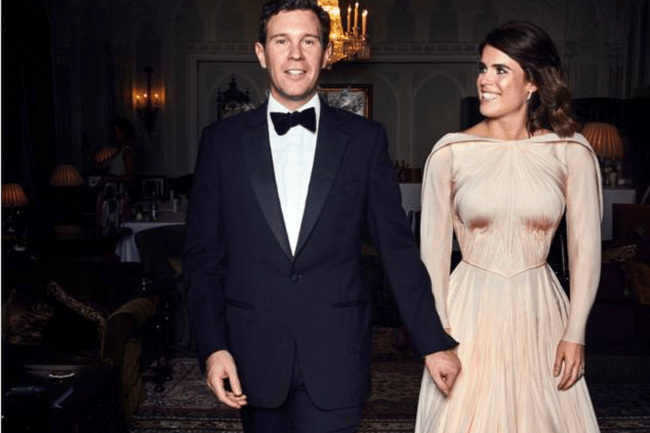 The unusual detail in Princess Eugenie and Jack Brooksbank's wedding 'thank you' cards. Newlyweds Princess Eugenie and Jack Brooksbank have wasted no time in expressing gratitude to those who wished them well on their wedding day. The couple, who married at St George’s Chapel in Windsor Castle on October 12, have quickly got into the post-wedding admin by sending out cards of thanks. And to add a unusually special touch, they’re handwritten. Instagram user loopycrown3, who describes themselves as a “devout monarchist and royal commentator”, shared images of the card they received from Eugenie and Jack just three weeks after the wedding. On the front is a formal photo taken at the wedding, showing Eugenie, 28, and Jack, 32, with their bridesmaids and page boys. Inside is a handwritten message which reads “Thank you from the bottom of our hearts for making our wedding so special and for thinking of us as we start our married life. We are completely overwhelmed with happiness,” and has been individually signed by both Eugenie and Jack. Royal thank you cards are regularly sent out following weddings, births or other big occasions, but they often contain a printed message rather than handwritten notes, which makes Eugenie and Jack’s card even more treasured. Prince Harry and Meghan Markle also sent out thank you cards following their wedding. The card featured Alexi Lubomirski’s now-famous black and white photograph of the pair, captured on the stairs of Frogmore House in Windsor just moments after the couple wed. The inside of the card read: “The Duke and Duchess of Sussex have been overwhelmed by all the incredibly kind cards and letters they have received on the occasion of their Wedding, and are so touched that you took the trouble to write as you did.